Reality Wanted TV Awards: The Nominees and Winners! Thursday night at the Supperclub in Los Angeles, was a fun and exciting evening celebrating and recognizing the talent and production in Reality TV. Here are a list of all the nominees and winners of each category. Our congratulations go out to everyone from Reality Wanted! The Second Annual Reality Wanted Awards are just two days away! Bigger and better than last year, it's the best way to recognize the talent and hard work that goes into producing all of the shows that we love so much. 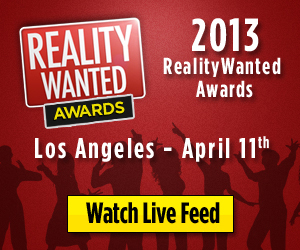 This year the Reality Wanted Awards will be held at the Supperclub in Hollywood on Thursday night, April 17th. Title: The Evilest of Them All: Who Will Win Best Villain at the RealityWanted Awards? Voting for the Reality Wanted Awards is getting more competitive than the Kardashian sisters, with nominees reaching out to Twitter followers for votes! The guest list is also on fire, with RSVP's daily from the largest personalities in reality TV wanting to walk the red carpet and potentially take home their award in person April 11th at Greystone Manor Nightclub in Los Angeles. Chicago, Illinois- December 30, 2008- BPONG.COM™, the official governing body of the popular and ever growing sport of Beer Pong, have announced that Dallas Imbimbo and Starr Spangler of the reality show “The Amazing Race” will be the co-hosts of The World Series of Beer Pong IV being held in Las Vegas at the world-renowned Flamingo Hotel and Casino, January 1-5, 2009. The event is the most competitive Beer Pong tournament in the world, with over 400 teams competing for a $50,000 grand prize. *Come watch the Race WITH the Racers! ---Reality Cares presents THE AMAZING RACE FINALE VIEWING PARTY & TOY DRIVE!